The Carlo Gavazzi RJ3A Series is designed in such a way as to replace electro mechanical contactors, especially when switching is frequent. It has an integrated heatsink and over-voltage protection. The heatsink is moved to the back for optimal space saving in the panel and easy wire mounting at the front of the relay. The relay with antiparallel thyristor output is the most widely used industrial SSR due to its multiple application possibilities and robust construction. 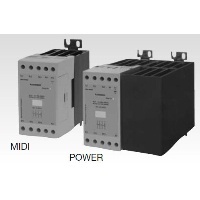 This relay can be used for resistive and inductive loads. The zero switching relay switches ON when the sinusoidal curve crosses zero and switches OFF when the current crosses zero. A green and a red LED give status of the control input and alarm respectively. ECD has a large inventory of automation and control products in stock and ready to ship including Carlo Gavazzi Solid State Relays. Call ECD today for all your Relay needs. Please call for quantity discounts, accessories and other configurations.